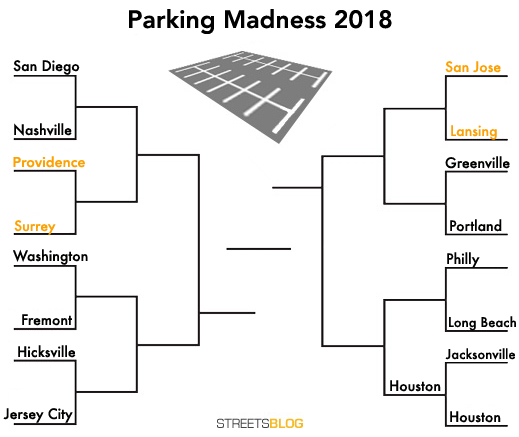 Streetsblog’s march through America’s urban parking wastelands continues with the third head-to-head contest in our Parking Madness tournament. Results are in from the first match, where Houston’s stadium/convention center cluster beat out Jacksonville’s failed redevelopment area next to downtown. Voting is still open for yesterday’s San Jose vs. Lansing contest. Today’s match features this year’s lone Canadian contender, the Vancouver suburb of Surrey. (Parking craters: They’re not just America’s problem!) The opposing parking crater is an asphalt-riddled hospital campus girdled by highways in Providence, Rhode Island. The area around Rhode Island Hospital in downtown Providence is mostly a flat expanse of parking lots. Something about the combination of large institutions and highway ramps just seems to choke off walkable development. While I-95 is a formidable barrier between downtown and this hospital and university cluster, all is not lost. 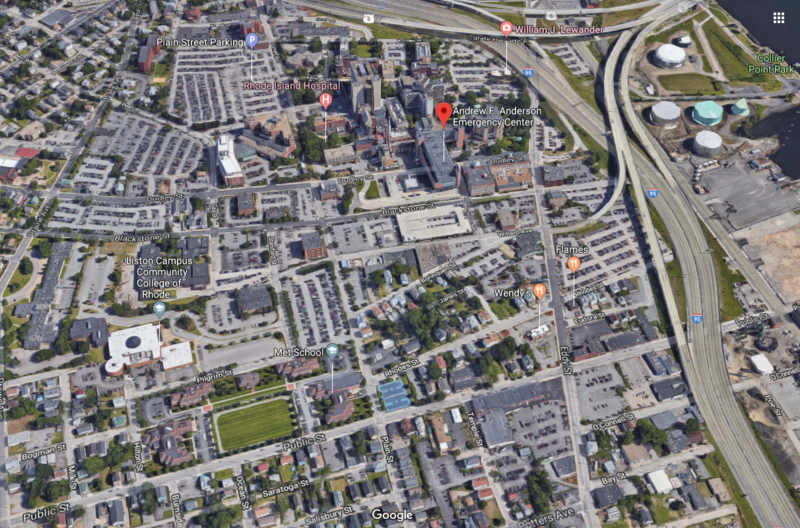 The reader who submitted this entry, who gave his name as Drew, says the area has good bus service that’s about to get better with the launch of the Downtown Connector, “a realignment of several bus routes” that will cut headways below five minutes. Sounds like transit good enough to build around. It is located next to a few features: the Surrey campus of Simon Fraser University, and the Skytrain station of Surrey Central. As can be seen, the majority of this wide area are parking lots. The roads are quite wide and the sidewalks are not. The parking lots often have fences dividing them, so you can’t walk through them to get from location to location and must walk through hostile terrain of the roadways. Of course, rarely anyone walks because of how hostile the area is. Which is worse? Vote below. Yes. Although the Surry one also has a train station in the middle of it, which makes the sprawl that much worse. There is something especially sad to me about hospitals located on highway plots surrounded by parking. It’s so hostile to public health. “Those poor students”? 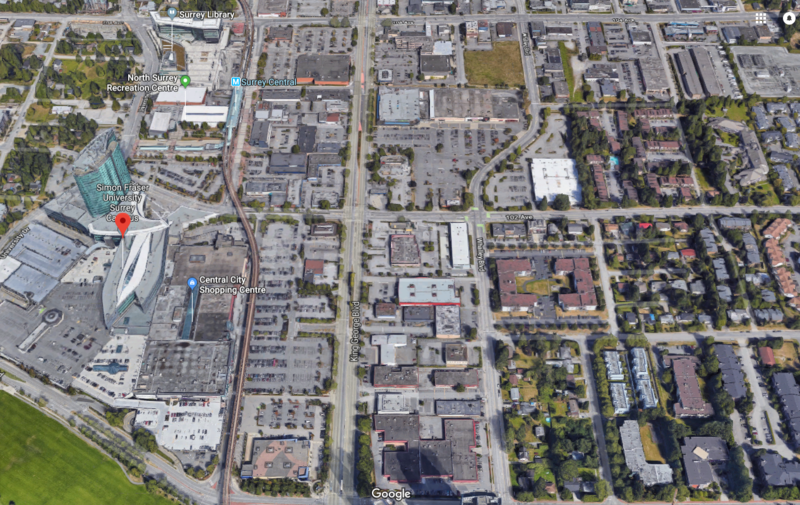 The Surrey example is not so much around a university campus as it is around a suburban shopping mall that has undergone a rather impressive urbanization and now sprouts a skyscraper, part of which houses a satellite space of a Vancouver university. It’s still mostly a shopping area. Compared to what was here in the 70s this is pretty much the ideal of what should happen to suburban parking craters. Also, half of the parking lots visible are not surface lots – they are parking lots on the roof of the mall. (You don’t see that much in America). 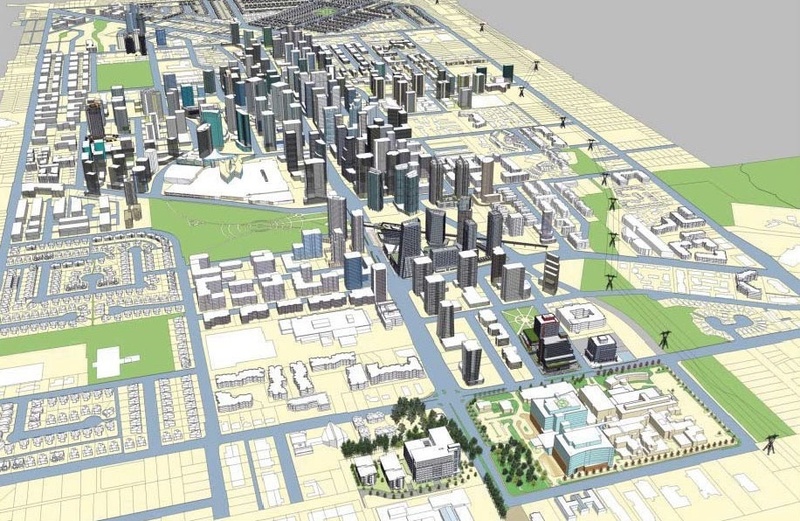 The areas that are surface lots are remnants of the usual big box stores that surround the perimeter of malls, but per the city’s new plan will look like this by 2040. So, yeah, not exactly a good example of a parking crater. I like to get around by bicycle but I chickened out of riding on the streets that lead to that hospital. At a meeting about a Hospital Master Plan in this town (same hospital company, different facility) I was the only person in the room who did not applaud the plan for more better parking. Employees must have free parking, period. I could not get anyone to understand why a parking cash-out might be a good thing. If we were voting on highways, Providence is way more egregious. But I’d say all that parking right next to the Skytrain in Vancouver is a little worse. An NFL parking moonscape takes on a pockmarked hospital campus -- and they're both right next to downtown. Philadelphia's triple-stadium parking crater takes on a parking-riddled campus in Long Beach, California. Which deserves to go on to the Final Four? Providence's improved State Capitol area or Indy's downtown growth? Two impressive downtown parking craters face off for a spot in the Final Four.